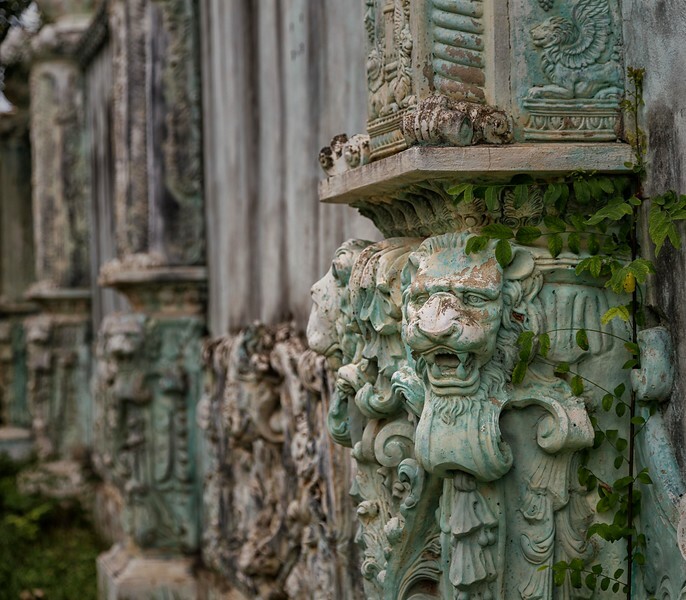 Built in the mid 1990's but abandoned at some point during construction, this unfinished & abandoned mansion of kitsch holds, let’s say, an ‘atypical’ decor which sets it apart from other structures in rural Thailand. What I call the Dolphin Bay Mansion sits 500m from Som Roi Yod beach in Prachuap Khirikhan Province. There are a number of strange rumors regarding the house, including some who say the place is haunted. Whatever the reason for it's construction and subsequent dereliction, this garish site is unlike any other I've seen in Thailand. It's so over-the-top in terms of grandiosity that it seems to belong in 17th century pre-revolutionary France, rather than in Southern Thailand in the modern era. It’s truly special place that I’ve been told is for sale if anyone has the funds! It was rather quiet in the area, aside from some barking dogs. I was overwhelmed with the strange beauty of this one-of-a-kind place, with a lot of questions popping into my head as I pressed the shutter button. What was the intention of construction? Why did they stop building? I really see it as more of a piece of art than an actual habitable abode, as it didn't exactly strike me as a cozy or livable house. However, there is some definitive beauty and even charm to be found in this lovely place. If I had a large amount of disposable income, I’d certainly consider buying it if it is indeed for sale.